I kinda had a feeling that the book will be good. It looked... different. Nice edition, hardcover, with some typographical tricks to make at least parts of it look like an old-style newspaper column. Let me introduce you to Orwell's Cough. It proved even better than I expected. 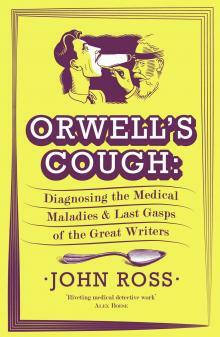 The idea for the book is simple: what illnesses did great writers of world literature suffer from? What, in the end, killed them? When it comes to choosing his 'patients', John Ross goes all the way due classics. Shakespeare, Milton, Swift, the Brontes, Melville, Yeats, Joyce, Orwell (obviously...) and a few more. The result? Curious and delicious mixture of medicine, eng lit and history. It appears that studying maladies of the illustrious people of the past is a lively field. Theories are ten a penny, ranging from sensible to outright ridiculous and Ross helpfully quotes many of them before advancing his own. He enriches the mixture with a generous helping of - let's be frank - celebrity gossip (only here the celebrities are known for some great writing as opposed to, for example, being born or wearing no underwear). I'm not sure if Ross's diagnoses are always spot-on. As I said, there's a lot of disagreement on those matters in the scientific circles, especially that sources of information get fewer the further in time you go. Nevertheless, Orwell's Cough is a fascinating book: funny, readable and with the potential to teach readers a thing or two.